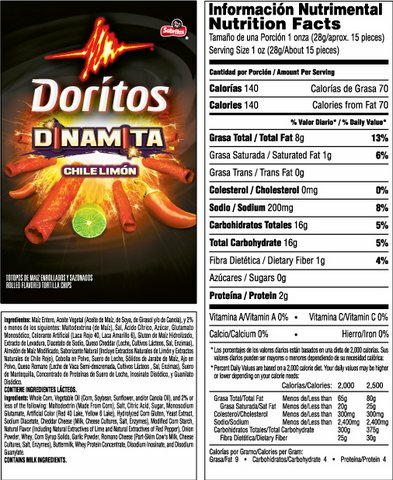 Doritos Dinamita Chile Limon are the perfect detonation of spicy chile with a twist of lime. They are made with no gluten ingredients, 0g trans fat and is pig (porcine free). Please refer to the nutrition facts for more information or contact the manufacturer Frito-Lay. 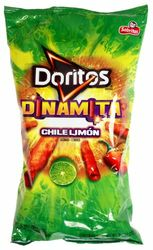 Doritos con chile y limon marca Dinamita. Takis and its generic counterparts (i.e., Taquitos) tend to feature the chile spice very heavily while the lime is relegated to the background. Not so with this Doritos version. The lime flavor is very strong by comparison. So you lose a bit of the heat of the aforementioned products but make up for it in complexity of flavor. These are basically the Americanized Takis, but it doesn't detract from the quality. The textures are different but the spice is the same. 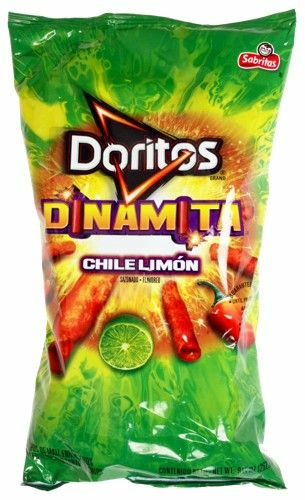 I used to snack on Flamin' Hot Cheetos with Limon, then Lays limon with some tapatio sauce, then Takis Nitro, now I am addicted to Doritos chile limon. They aren't sold everywhere and I am sooo happy that MexGrocer sells them! I'm in love with these. I can't get enough. I order them in 6 bags a shipment. I run out before my next shipment gets here. I truly have withdrawals when I'm out of them. There's nothing with the same taste..I have to have them. I wish my order would hurry & get here!! ConsIt's a tad bit too hot! ProsThe lime and the hot pepper are just wild. ConsCannot find them anywhere. The bags need to be bigger :).